I know you were all holding your breath, waiting for the next installation of my pontification on shade gardens, but I happen to be in Mexico and decided to write about something more immediate. First of all, Mexico is a beautiful country. Simply put, it is hard to go wrong here; the food is incredible, the landscape diverse and interesting, and the people are incredibly nice. Hence, I am torn as to what to write about. I have seen many inspiring gardens and landscapes but ultimately I decided on writing about something both interesting and important for folks to know. The first part of our trip was spent in Michoacán with a guide whose mission is reforestation. He is tackling a hard battle against the loss of forests in the area resulting from logging, farming, and now the big threat of massive avocado production. Avocados are the new cocaine in terms of the fortunes to be made and some of the cartel-like support systems. The resulting forest devastation has numerous ramifications: erosion, mud slides, but most of all. 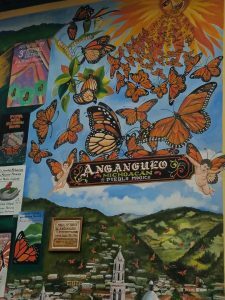 the loss of the winter habitat of the monarch butterflies. The monarchs are being hit from all sides losing their necessary habitat (breeding and food resources) in their summer and winter homes as well as along their way. We stayed at our guides’s amazing hacienda for a few days where he has a huge nursery that produces sseedling trees for his and others reforestation efforts. He produces millions of Oymel/Sacred Fir (Abies religioso) and smooth- bark Mexican pine (Pinus psuedostrobus) seedlings as well as other important and endangered conifer species. The oyamel forest is Mexico’s most endangere forest type with only 2% of the original forest remaining. We saw some of the reforestation sites and visited 2 locations in the mountains where the monarchs overwinter in the sacred fir trees. It was quite amazing and beautiful to see the limbs of these trees laiden with butterflies and many thousands of them flying all around. I took some videos but there are much better ones to be seen on youtube. 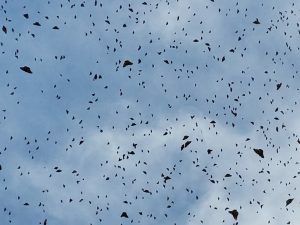 Search for “Monarch Butterflies: Great Migration”; you will find a short video that really captures it. However, the winter habitat is only a part of the big picture and the problem. The other issue is the decline of milkweed in North America. Researching this subject took me way down the rabbit hole, but suffice it to say that we have lost a lot of milkweed over the years due to a simple loss of area for the native milkweeds. This has been caused by development, chemical and GMO farming techniques. There are primarily 3 milkweeds that grow in our area here in the Catskills: the common milkweed (Asclepias syriaca) that seems to be abundant in many meadows and sunny areas, the orange butterfly weed (Asclepias tuberosa) that is a well-loved garden plant but somewhat difficult to establish and the beautiful pink swamp milkweed (Asclepias incarnata) that is a very reliable but needs a moist area to be happy. I love the wild milkweed and encourage it in the wild places on my property. I wish I could tell you the secret for success with butterfly weed; I got discouraged after a couple of failed attempts but I have had it volunteer from seed in my garden. I will try again, it is worth the effort. The swamp milkweed is a great plant for a wet area and very easy to establish. Be kind and try to provide milkweed for the monarchs. 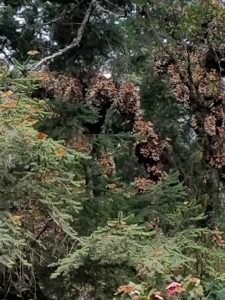 I want to share some of what I have learned about the monarchs and why milkweed is so important. Describing their life cycle has a little of the “chicken and egg” problem. Let’s start when a monarch butterfly lays an egg on a milkweed plant in the spring in northern Mexico or the southern U.S. This first generation continues to the northeast or Canada but also in other areas around the country. This egg has to be on a milkweed for it to result in a healthy larvae and subsequent butterfly. The egg hatches a larvae in 4 days; that larvae munches down on milkweed for 2 weeks to reach full size and then goes into the crysalis s tage. This stage is weather dependent, but approximately 4 weeks, and then the butterfly emerges. This butterfly will flutter around enjoying life for 2-6 weeks, lay eggs and die. This happens 2 or 3 more times during the summer. This is able to happen because four to seven days after emerging from its chrysalis, a 2nd or 3rd generation monarch butterfly is old enough to mate (wow!). The 4th (or 3rd if it they are late enough) crop of babies is different from the others. This last group is born in late August through October and are able to live a lot longer. Some 3rd generation monarchs are able to fly to Texas to give birth to the 4th generation and some are born late enough that they fly all the way to Mexico. A 4th generation born in September or October will fly to Mexico with only snacking stops along the way. They are born with the capability to store more food resources before the migration trip but actually get even fatter on the way to Mexico (if they can find enough good snacks. After reaching Mexico they cuddle together in the oyamels while it is cold and then start moving around when it starts to get warmer in January and February. By March or April they fly north and lay their eggs in northern Mexico or the southern U.S. (we need milkweeds there as well). This generation (the first!) finish their development a little later in order be able to mate and head back up to the northeast to lay their eggs and start the whole process over again.